Are you the parent of a current or former student at Morongo Unified School District? No, none of my students have attended any schools in Morongo Unified School District. Welcome to MUSD! Start the Pre-Registration process for new families here! After you submit the pre-registration you will receive an email from Illuminate with instructions on how to register your parent portal with your access code. Once your portal registration is complete you should sign in to fill out your student's enrollment forms right from your portal! You can even upload required documentation! NOTE: Enrollment forms are found at the bottom left under "Pre-Registration". Yes, I am the parent of a current or former student at Morongo Unified School District. You should have a parent portal! Let’s get you in! Please login with your email as your username and the password you made at the time of your portal registration. Returning Student Registration Forms are sent to your portal by contacting your school and take only a few minutes to complete and are listed under "Forms"! Never registered for a parent portal? No problem! 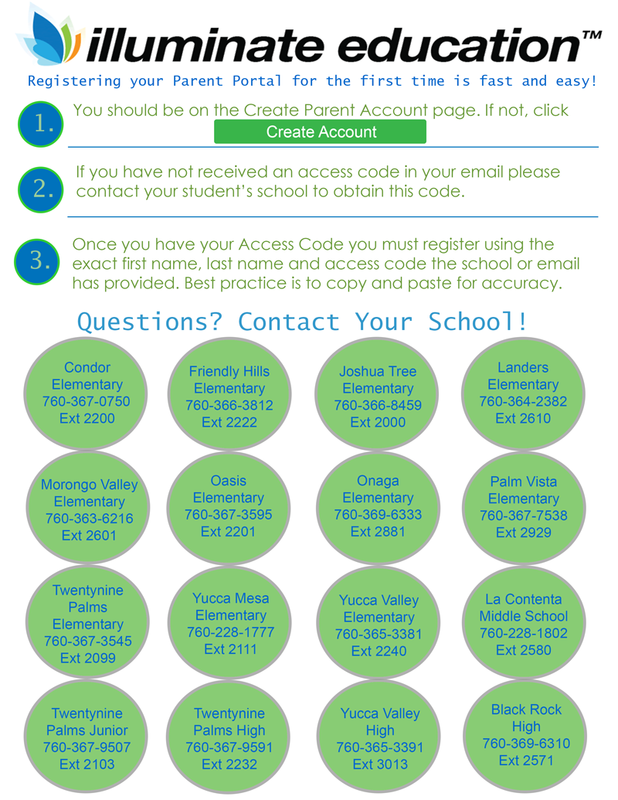 Contact your school and they will provide you with the first name, last name, and access code neededed to register your parent portal. Need assistance? Find assistance and school contact info here!